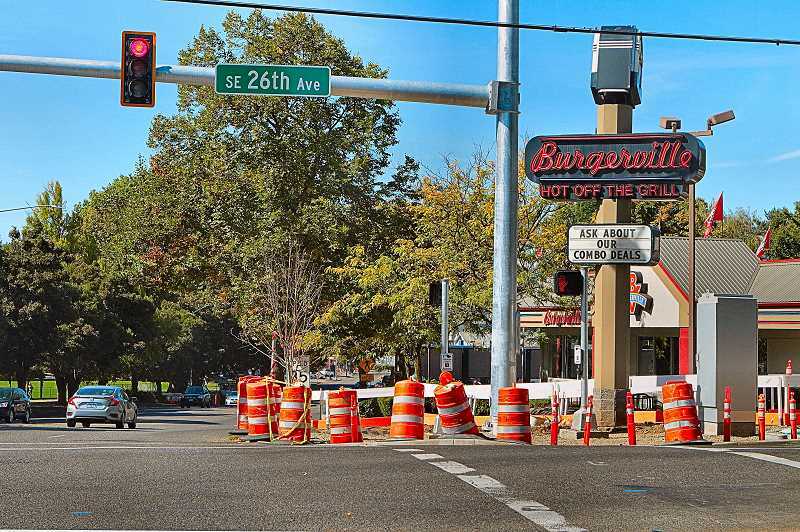 After years of planning, the Oregon Department of Transportation's "Powell Boulevard Safety Project" is well underway. However, as many residents have pointed out to THE BEE, the work seems to have stalled recently, with several intersections along the ? ?$3,757,655 project still only partially completed. THE BEE asked "ODOT Region 1 Area Manager, Central" Shelli Romero why the intersections at S.E. 33rd Avenue, 26th Avenue, and 21st Avenue remain barricaded. "The intersection near Cleveland High School should be done in the next few weeks; some of the delays have to do with weather," Romero told us. "At that intersection, not only is there a new signal that we put in, but on the southeast side, we're also installing a new Pedestrian Platform, so there's more space for students to wait, away from the street, for the signal to cross to the high school. "And, we're constructing a Truck Apron, an area of the road that looks a little different, to allow more room for longer trucks to make their turns," Romero said. About the work at S.E. 33rd Avenue – a signalized intersection that borders the Cleveland High athletic field – Romero remarked that some of the delay has to do with the sequencing of work that ODOT doesn't have control over; the contractor can sequence its work in the way as it sees fit, while maintaining the overall construction schedule. The narrow intersection at S.E. 21st Avenue has irked many who cross Powell Boulevard there. "That's a really constrained area; that makes it a challenging place in which to work, while we do maintain temporary pedestrian access during construction at all times," explained Romero. THE BEE pointed out that the utility vaults at the 21st intersection have been installed, but remain open and empty. "Working with utilities takes coordination; we work with the City of Portland when installing new traffic signals, and we have to work around the different priorities and schedules of all of our contractors," Romero responded. Romero concluded the interview by reiterating that the project is still scheduled to be completed in early 2019. "I'm confident we'll have good improvements on the ground shortly," she assured us.